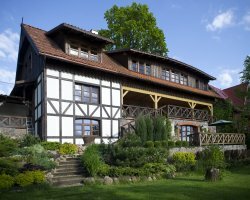 Holiday House "Laworta" is located on the southern slope of the highest mountain of Lower Ustrzyki - Stone Laworty, with a panoramic view over the city and its surroundings. It is a three-storey building, surrounded by 2 hectares of fenced green area with its historic manor park. The unique scenery, proximity to nature, tranquility and well-developed infrastructure and recreation - sports and training provide excellent conditions for rest and relaxation and the organization of conferences, seminars and motivational integration.